I felt honored the day a little boy waved at me. He was sitting by his back door on a nice spring morning. 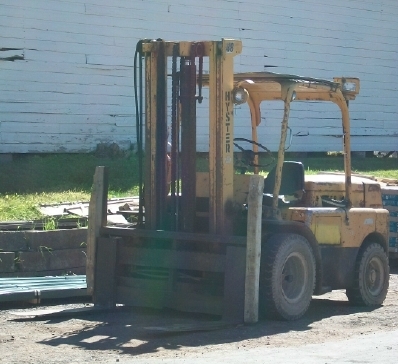 I was across the alley running a forklift for the lumber company for which I had recently started working. Presumably, he would have waved at any adult whose attention he could claim, but then, I was a little boy once too. A man driving a forklift is exciting to a preschooler. Driving a forklift comes across as less exciting to the man driving it. True, this former little boy still enjoys playing with his grown-up toy, but exciting it isn't. After all, I used to wave at police cars and airplanes. There were some really thrilling possibilities out there, and they beat doing hard physical work for moderate wages in a small-town lumberyard. And yet, my tiring workaday life was exciting to a little boy. I don’t know for sure what he thought, but his wave made me feel just a bit like a hero. Somebody else was watching me that day--Somebody a lot bigger than a little boy or a disappointed forklift driver. God was watching. Now, God knows a lot more about me than even I do. He knows my failings. He knows my disappointments and questions. I’m no hero in His presence. In fact, it would be a relief to learn that my Christian life even reaches the mediocre mark on His scale. But be that as it may, God’s record is that He loves me. Think of it. Yes, we know. He sent His Son to die for ordinary failing people. He promises to be with us, imperfect though we are. He offers to take care of our sins for the asking. He promises a home with Him in Heaven. We know all that. But He also says that the hairs of our heads are all numbered. Or, to think in everyday terms, when God looks down at me on my employer’s battered old forklift, He likes what He sees. He doesn’t wave, but He watches and is happy. That’s enough to make a guy look up into the heavens and wave long and hard.